Little is known about Chinese American dementia caregivers’ psychological and physical response to caregiving. 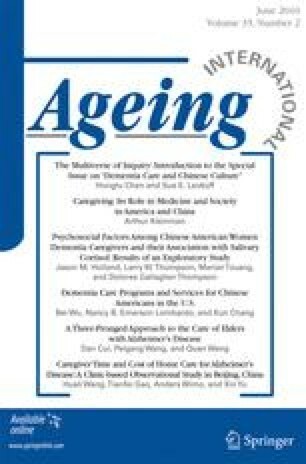 In the present study, descriptive information is presented for a sample of 47 Chinese American dementia caregivers on a variety of psychosocial measures, including measures of depressive symptoms, overall perceived stress, stress specific to caregiving, coping, positive aspects of caregiving, caregiving self-efficacy, and belief in Asian values. Additionally, the association between these psychosocial factors and diurnal cortisol patterns is examined. Generally speaking, these caregivers were found to report significant levels of distress (e.g., depressive symptoms) but also showed indications of resiliency, as suggested by their high levels of self-efficacy, positive caregiving experiences, and problem solving. Stronger beliefs in Asian values were associated with more normal cortisol patterns, less depressive symptoms, and greater self-efficacy, highlighting the salience of culture in shaping the caregiving experience of Chinese Americans. The views expressed here are the authors’ own and do not necessarily represent the views of the Department of Veterans Affairs or the United States Government. U.S. Census Bureau. (2008). An older and more diverse nation by midcentury. Retrieved October 29, 2009, from http://www.census.gov/PressRelease/www/releases/archives/population/012496.html.